What Happens When Two Skiers Collide? If you've just moved to Colorado, we can't blame you – this is an amazing place to be. But there are a few things you need to know if you're gonna be a Colorado resident, including how to drive in inclement weather, where to find the best green chile, and proper ski/snowboard etiquette. Which, speaking of skiing, did you know that the state of Colorado has laws in place regarding actions on the ski slopes? The Ski Safety Act of 1979 has been referenced a few times as of recent (referring to collisions on the slopes), and that got us thinking: What happens legally when two skiers collide? 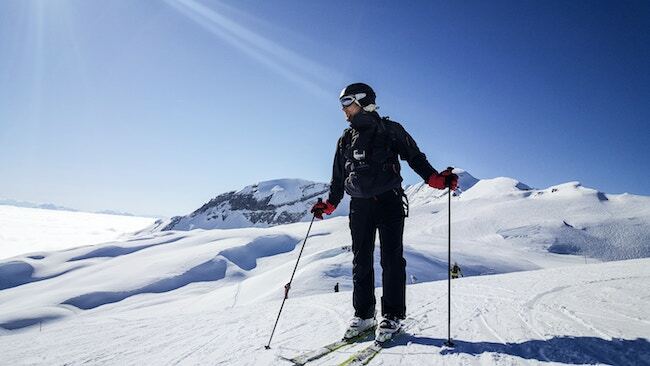 Well, like auto accidents, skiing in a negligent manner increases the chances of an incident, and if somebody causes an accident or collides with another they could be prosecuted or be responsible for damages. The Ski Safety Act delineates that each skier has a duty to maintain control of speed and course; that no skier is to ski in areas posted as 'closed'; that skiers are to stay clear of snow grooming equipment; and, of course, not be "impaired by the consumption of alcohol or by the use of any controlled substance." Oh, and that leash that keeps your ski or board attached to you should you fall? That's required by the law, too. Should a collision happen, and cause injuries as a result, the law says that parties involved are supposed to stay on scene and give their name and current address to the ski area operator or ski patrol. Leaving the scene is acceptable to go get help for the injured party, so long as the party that left provides their information after securing aid. And that's just to name a few. You can read the law in-full here. If you get caught violating these statutes, the resorts will typically give you a warning or they may revoke your skiing privileges (yet another power afforded by the Ski Safety Act). Law enforcement, on the other hand, can issue you a Class 2 petty offense ticket and a fine up to $1,000. It should be noted, however, that charges could be (and probably will be) more severe should your negligence result in somebody's serious injury, or worse. Well, what do you think? Did you know that there's a law in place should you collide with another skier, among others? Share your thoughts with us in the comments below. Want to hear more about what's going on in Colorado? Did you hear about Colorado's new Gaylord Rockies Resort?